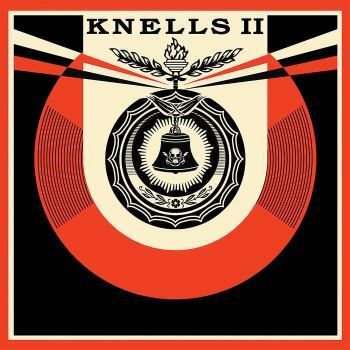 The Knells, headed by guitarist/composer/visionary Andrew McKenna Lee are back with a second album this past November with the insightfully titled Knells II. From Brooklyn, NY these guys pursue a prog track that veers in a direction I've never really heard before. Now I'm familiar with prog rock from all eras and a little less familiar with centuries of choral music. I like both genres but never really expected to hear them together in the same setting. The setting being brilliantly arranged prog rock topped with renaissance style choral arrangements. If you're not familiar with The Knells, their first long player was reviewed in 2013 (see review). This album is, I believe it to be a little more organic and natural sounding with respect to the music itself and production. ....Except for the voices! Three lovely lasses singing in polyphonic glee over top a totally engaging bed of beautifully played progressive rock. With emphasis on 'rock'. With only guitars in the band they sound like a regular rock band playing music that isn't quite rightfully theirs. But it is so theirs. This is real 'prog' music. For those of you who like to get lost in the intricacies of odd time signatures or polyrhythmically perfomed drums over a regular beat and constantly changing 'scenes' this album will scratch you right where you itch. My wife, Mrs. A. walked into the room one time I was playing this and she said that it totally sounded like something I would be listening to at any given time. 'Are you listening to YES?' She's very familiar with this sort of thing. However she stopped too, at the first sound of the voices. 'Oh, that's different'. Neither one of us could recall hearing that style of singing on any rock record. These are well arranged harmonies that follow the music faultlessly and I'm sure that a lot of people will enjoy this aspect of the album and band. The tunes never get boring or samey. It's always interesting, always engaging and there's even a psuedo-fist pumping arena rock tune (prog style) with that renaissance choral narrative floating over the top of the proceedings. I only have one complaint, and it's just my opinion; I could do with just a little less polyphony and a tiny bit more monophony unison in the singing. More of the single singer or all three singing in unison to make the big moments when all three of them go into the harmonies more special or impactful. The point of the band is that poly style of singing though so many folks will probably like this and many folks already do. It is a great album. An orginal hybrid of prog and choral work that I don't think you'll hear anywhere else. The music is brilliant. Loads of peaks. Lots of light and shade. A real journey. It is wonderful in headphones too. If this piques your interest, you must go over to their website and check them out. There are some live performances and a marvy lego video for the arena rock song. Get this album! In fact, if you are one who likes the physical artifact, go to the website and get it on fabulous red vinyl before it's too late. Now!